After a period of recording and performing as a professional musician, Burns Stanfield was ordained in 1991 as a minister in the Presbyterian Church (USA) to pastor a congregation in a low-income neighborhood of South Boston. While this church was once near closing, it has since grown substantially and is now a vital community presence. It runs a community arts ministry, a large free summer day program, tutoring ministries, recovery efforts, and more. Rev. Stanfield also teaches at Harvard Divinity School and Andover Newton Theological School.He continues to write music, perform and record. Family Prayers is a CD of original songs, and a follow-up is forthcoming. 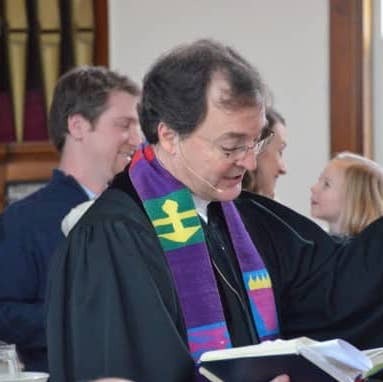 The church’s community commitments have been recognized by the national Presbyterian Church, Harvard University, the South Boston community and the city of Boston. Katie grew up in North Carolina and attended UNC Chapel Hill, where she did not study music, religion, or social work, but found herself doing all three all of the time. During her summers, she worked with the Appalachia Service Project, Inc., working to eradiate substandard housing in central Appalachia and inspiring lives to Christian service. After four summers in Virginia, Kentucky, and Tennessee, she found herself duly inspired to add a social work degree to her seminary studies. Katie moved to Boston from North Carolina in 2008 to pursue her M.Div. and M.S.W. at Boston University. 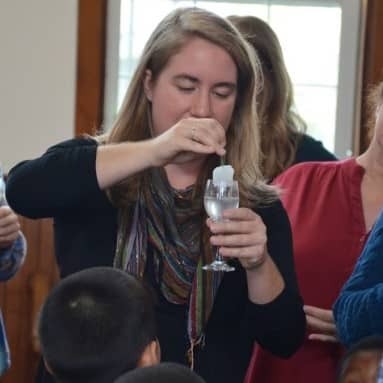 She had every intention of moving back South after finishing, but her adventures in Boston with the community at Fourth Presbyterian Church, as well as her organizing work with the Greater Boston Interfaith Organization, compelled her to stay a little bit longer.